In Sevastopol, they plant potatoes in February. And the almond trees bloomed earlier than usual this year, not to mention the snowdrops. Sevastopol in February is miserable – the sun is half-extinguished, the green plants are half-faded, the cypresses are plucked, the poplars are like bare brooms, the grass is withered. At times precipitation blows about, at times it dribbles, at times it sputters. The sea is gloomy gray and hazy, as if though someone mistakenly filled the bays with Baltic waters. I wonder around the ships, finding old acquaintances and making new ones. Here’s one of them, and not just one, but with an addition of a spouse. He is Oleg, Captain of the 3rd Rank, captain of the destroyer’s missile/artillery department. She is Olga, Oleg’s wife, former research associate of the Sevastopol Mikluha Maklay Institute of Biology of the Southern Seas (INBYuM ). They are both thirty years old. They have a five-year old son Igoreshka. How they met, fell in love and got married is another story, although there's plenty of unordinary and interesting to say about that too. For now let’s talk about the bare economics and pure sociology - how an "average" officer's family survives in Sevastopol. Last time Olga was paid her salary was in September of last year. Oleg - after a four-month delay - in December. But even if they were paid promptly month-to-month, it would still not be easy to survive for three people (not to mention the retired parents who also need their help), considering the cost of living in Sevastopol today. At one time they were living off of bread and mussels. INBYuM tried to “enter the market” with their marine mussel farming plantation. But, alas – mollusks make too slippery of a foundation for fundamental science. And then they turned to the “ships of science” – expedition vessels Professor Vodyanitskiy, Mikhail Lomonosov and others that before perestroika sailed under the flag of the Academy of Sciences. The “White Steamships” unwittingly repeated the Russian voyage of sorrow “from Crimeans to Turks” of 1920. Back then, they were saving their lives from flying bullets, today - they are saving themselves from poverty. That's how the noble research associate Olga Sokolova became a “shuttle trader.” She works “leather” – transports leather jackets, caps, vests, and coats from Istanbul. Her husband meets her in Sevastopol, in the harbor station Morskoy Vokzal. Covering the shoulder officer insignia with a Turkish jacket, Oleg helps Olga move the tightly packed striped bags. They go to the "5th kilometer" - that's the name of a gigantic second-hand flea market on the outskirts of town. Linen ropes are stretched between tree trunks of Crimean young pine trees, and on the ropes, in this endless labyrinth of a wardrobe, pitiful parody of the Istanbul’s Old Market, hangs clothes of all styles and colors. Better equipped market places exist as well. You can pay 500 bucks a month and draw in the customers, not forgetting to pay five hryvnas per day of trading to the so-called “security.” Oleg made an attempt to restore justice, but he was quickly put in his place – “If you don’t want your wife in pieces, don't stick your nose into our business." While working at the flea market is dangerous, Istanbul is no better. Each time his wife sails out, Oleg can't find peace either on his ship or in his apartment. Not too long ago, a hotel where shuttle traders lodged was blown up - twelve people died, including Olga’s neighbor. But the Sokolov family earnings grew sharply with Olga’s trips. “You are in the open sea more often than I am!" says Oleg with a hint of either resentment or surprise. And that’s the truth. The wives-“shuttle traders” work to raise combat readiness of the Black Sea Fleet, feeding and clothing their husband-fighters. It’s all good, except that Olga gets very sea sick on the motor ship in rough weather. Oleg doesn’t get sea sick. But his fate is to remain moored by the wall. There was a time when women saved the city of Carthage, giving up their braids to make bowstrings to furnish the stone fougasses. What must the Sevastopol wives give up to save the Black Fleet, still decorated with the Order of the Red Banner? On the Ostryakov prospect, near the market, I observed a huge black bull ransacking a garbage container. And that’s in the Year of the Bull! There’s a sad symbol of the present Sevastopol, and, perhaps of all of Russia. But Sevastopol is my city. I wasn’t born here, but every year I come here - not to visit anyone, not on a business trip, but to work. The sea still changes colors like a chameleon behind the Primorsky boulevard, the horseshoe-shaped Konstantinovskaya Battery protecting the bay is still as white, the spring sun still imprints a carved shade of the acacia trees on the white wall of the bastion, but the game of light and shade in the city changed drastically, as if now the sun rises not in the East but in the West. A different kind of shade settled onto the faces of the citizens – they became grimmer, angrier, distrustful. A common grimace is to wait, hold out, overcome this strange new life that befell them in August of 1991. And even the city of Sevastopol itself suddenly transformed from a glistening-white untroubled lieutenant of the Navy into a downcast veteran, tattered by life, overcome in a matter of an hour by the burden of the two hundred years of his existence and of the wars, sieges, and adversities. The latter words were uttered by the Admiral Nakhimov with his last dying breath. The bronze naval commander from the height of his pedestal gazes at his own words, inscribed white on red, and at those who hold them up high. Behind his back is the white ridge of the colonnade of the Grafskaya Pier. In the gaps between the severe Dorian columns one can see the destroyers, the GM cruisers, and farther on, over the Pavlovsky Cape, there are the tenders, water tankers, towboats – the waterborne backup of the former Mediterranean Sea Squadron. These are my ships, ships-letter carriers. There was a time when they all sailed out into the Mediterranean – the Great Sea of the Sunset, as it was called by the ancient Greeks – to supply the ships that were there for up to a year, serving active military duty in any-minute readiness to enter combat and to put a stop to any hostile attempt of the NATO Navy. And we met up with them, the Sevastopol messengers from Homeland, in the set rendezvous points, and more than the drinking water we craved those letters to be thrown over onto our decks in large paper bags. It’s now almost instinctive, when meeting a Sevastopol sailor, to throw a glance at his cap – what is your “crab” (Russian sailor’s slang, stands for the emblem of the Fleet), what Fleet do you serve? There exist all sorts of different “crabs” – those with Ukranian trident, and with a Soviet star, and with the eagle of Russia. One time I saw one with Muslim crescent moon – it belonged to the Turkmen students that nowadays study in Ukraine, in the former Sevastopol Higher Naval Engineering College, presently the Morskoy (Marine) Institute. Come on guys, it wasn’t that long ago that you stood together in one formation, on one deck, each morning raising one and the same flag! What force is it that has thrown you onto separate decks, separate wharfs, under separate flags? I stroll around Sevastopol, looking for answers to these and other uneasy questions. “I have no doubt that we would solve them… But we are not the deciding authority. It's the politicians who decide these matters. Behind the back of the Ukrainian Fleet commander more and more distinct is the shadow of an American admiral. For it’s the Pentagon who finances joint maneuvers Sea Breeze of the NATO and the Ukrainian Navy this summer. They are going to take place in the Ukraine’s maritime belt. The goal of these maneuvers is quite equivocal – “naval blockade to localize the international conflict in Crimea.” They offered us to participate as well. We refused in view of the provocative character of the Sea Breeze. Is this not a repeat of the Anglo-French blockade of Sevastopol in 1854? And thus we exchanged questions with the Fleet’s commander, not finding any definite answers. And yet, they could be found. My feet carry me to the square in front of the Grafskaya Pier. The bronze Nakhimov silently gazes at his nonsensical descendants, swarming around the currency exchange stands and kiosks packed with imported mass-produced goods, at the merchant ships in the military docks, at the multicolored - yellow and blue, white-blue-and-red – striped patterns of flags on the masts… For some reason, wedding couples rush in to share with him, an old bachelor, their flowers. Then there is an old former naval trumpet player who comes here on Sundays, takes his instrument out of its case and plays a stirring song of soul and brass. He performs his concert for trumpet without orchestra to the deep-red sun, disappearing into the blue of the evening sea. And the Sevastopolians, pulled out of the habitual circle of nagging worries, slow down and raise their heads. And they see a white “horseshoe” – for military luck! – of the Konstantinovskaya Battery, and the Russian flag soaring over the General Staff of the Black Sea Fleet building, and the golden cross of the Vladimirsky (St. Vladimir) Cathedral, blessing the city over the head of the iron cast Lenin, pointing for some reason in the direction of Bosphorus, and over the bronze bayonets that pierce the sky, over the ship masts entwined with the wind, and over the television antennae submerged in broadcast lies. Booming of the guns, not from the bastions but from the Feolent firing ranges, still floats across the water, making windows of the houses on Krepostnoye Shosse (Road) vibrate. Tanks fire, marines prepare for battle. But what battle? Against who?! On whose side? It’s nighttime over the wharf Minnaya Stenka. A heterogeneous crowd of ships is moored facing the sea, their back to the city. A full moon disappeared somewhere in the jumble of signaling lights, lit up portholes, deck chandeliers and restless searchlights. Each ship is a small Sevastopol. The city dims its lights, as in a military dim-out - saving electricity. Southern constellations trace their mysterious flickering signs over the city and the sea. But no one is reading this semaphore of stars. For a year he carried a note, saying “I was killed by so-and-so”, in his pocket. That’s in case the killer doesn’t miss. Actually, he is not a bad shooter himself. He doesn’t keep a weapon though. Ever since 1990, when he handed in his gun and dirk, surrendered his responsibilities as the chief engineer of the Balaklavsky ship repair plant, and took off his shoulder insignia of the Captain of the 2nd Rank, he found himself a new weapon – a pen of a political writer-kamikaze. He never wrote anything in his life, aside from short letters to his mother who lives in a Belorussian town of Oshmyany, and repair records. Then all of a sudden he produced an article on the accident rate in the Fleet, published in a literary journal right off the bat. And then it was like the Divine spark flared up, and the name Vladimir Stefanovsky spread around the metropolitan and the Crimean journals, newspapers, and other literary publications. “Half the town (Sevastopol, to be assumed) is upset with you!” laments his wife. “Half” is of course an exaggeration. But one thing for sure – all the authorities of Sevastopol dislike Stefanovsky – the official and the hidden, the legitimate and the mafia alike. And so he carried the note for a year – not because he was afraid, but to immediately point to the murderer. Besides, what could a submariner possibly be scared of on land? It’s not without reason that the English say, "Worse things happen at sea…” Indeed, the marine engineer of the oceanic submarine, Lieutenant-Commander Stefanovsky did experience worse things at sea. Why is Stefanovsky disliked? For the same reason they don't like revenue inspectors - he demands repayment of debt, the debt to memory. He demands it from the city government and the ministries, from the Russian, the Sevastopol, and the Navy authorities. And the authorities are not happy about that. So they curse him and defame him, the tireless now Captain of the 2nd Rank, leader and organizer of the human rights association “Sailors and Ships” in Sevastopol, every which way they can. Disturber of peace is now his social role. By what right? "By the right of the former torpedo fodder. I could be rotting somewhere in a compartment of a sunk submarine right now, like the guys from Ê-129, or be burned alive like they were on the destroyer Otvazhny. And not a word would be spoken about my fate, like it’s not spoken about theirs - for decades! I was lucky – I survived. And to repay for that luck I will be demanding: hats off for those who gave their lives for you, who was swallowed by the sea, who accompanied their ships into the deep abyss, not abandoning their duty. One of the committees of the Sevastopol Naval Assembly is overloaded with used clothes, toys, and containers with child nutrition that’s not yet too expired. It’s the humanitarian aid from Germany, for the elderly Sevastopol sailors and their grandchildren. Stefanovsky looks at all this godsend in confusion. His face carries an expression of sad dismay. Two Ukrainian customs officers rummage in the old blazers and pants. What for? They are estimating the total value of the goods. What for? To determine the tax to be imposed on the humanitarian aid. What for? To enrich the national treasury. At whose expense? At the expense of the Naval Assembly, the recipient of the humanitarian aid that arrived from Germany, or at the expense of the Germans who sent it? “Do you know what this means?” demands Stefanovsky, “If I give alms to the destitute on the street, do I have to pay taxes? Or does he? What kind of law is this?! Custom officers stay in an embarrassed silence. They are soldiers. If they are ordered to “custom clear" the cargo, they clear it, even though they don’t enjoy doing it. Stefanovsky visits the mayor’s reception. Stefanovsky writes open letters to the Ukrainian President, urging him to repeal the immoral law. Sevastopol newspapers print the letters of one President (of the Naval Assembly) to the other President (of Ukraine). Knowing Stefanovsky, I would not be surprised if President Kuchma goes ahead and revises the Law on Humanitarian Aid Taxation. Alas, Sevastopol… The story with the Germans goes as follows. In all of World War II, Sevastopol is the only city the Wehrmacht paid for by simultaneous loss of two armies – one was beaten in 1941-1942, the other – in 1944. 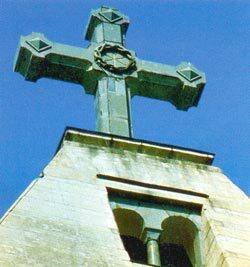 Becoming aware of this fact, the surviving Wehrmacht veterans came to Sevastopol to repent before the Great City and its inhabitants. Among those who received the group of delegates were members of the Naval Assembly. The defeated came to the victors who were leaading a life of appalling poverty, and went down on their knees, begging for forgiveness. Stefanovsky’s father died at the battlefront, possibly from a bullet of one of those old men that were now kneeling before him and before the city. And he forgave. 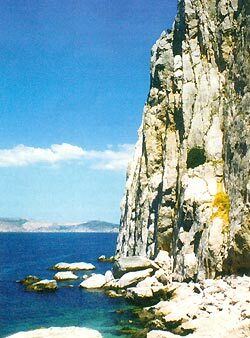 Even though not everyone in Sevastopol understood and accepted this act of penitence. Those who don’t know how to pray don’t know how to forgive. Then there was a meeting of veterans of the battles for Sevastopol from both sides. Former 87th platoon commander of the infantry division, Lieutenant Elsner took stage. He told of the hardships they had to overcome when storming the village Komary near Balaklava to finally take it on the third day of continuous attack. “If I hadn’t been wounded, like hell you’d take it!” yelled one of the Balaklava defenders from the audience. “And a victim of perestroika,” sums up the commander of the winged rarity, Captain of the 2nd Rank Nikolay Goncharov, a sharp-tongued and swift officer, a good match for his ship. “Why victim of perestroika? Judge for yourself. When the Military-Industrial Complex went into “starvation diet” mode, the unique battle ship with an experienced crew that had 13 missile-firing exercises under their belt, for several years stayed in the bay until its corrosion-ridden hull began to leak. 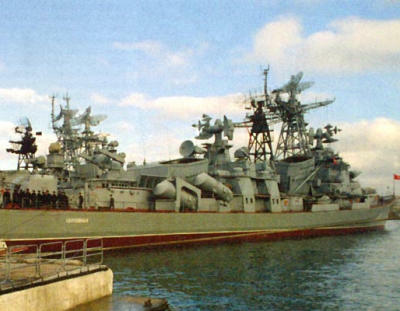 Thanks to the Admiral Kravchenko – he ordered to place the Bora into the dock and transfer it into an active brigade of missile ships. He personally oversaw us and even performed the ship readiness check. No one has ever seen a fleet commander personally overseeing military service setup on any other ship! No question that the Bora is not just “any other ship.” By the novelty and rarity of its engineering, it’s a break into the 21st century. 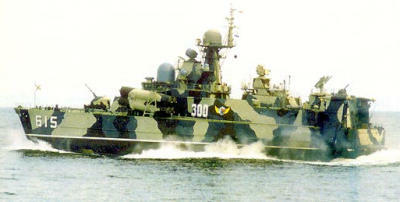 Of the ten projected missile hovercraft of “Sivuch” class, only two managed to come off the building slips, and only one – the Bora – to pass the series of government tests. “Come into the open sea with us,” offers Goncharov. “You’ll see what kind of a beast we have here. Just make sure to get an "ok" from the command." An “ok” was obtained, and in the early misty morning, the Bora was about to unmoor. But before the aft separated from the wall of the dock, the crew made a considerable all-out effort to prepare the ship for combat and the campaign. 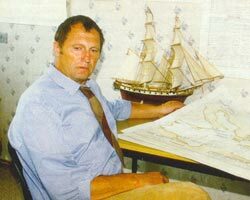 The problem is not limited to an insufficient number of mates and sailors in the crew. The problem is that the complex semi-aeronautical technology requires special preparation, done not by the engineering crew, as it very well should, but by the officers and sub-officers themselves, as dictated by her Noble Highness, Lady Need. No one has the budget for repairs – not the crew, not the brigade, not anyone else in the Fleet. And the experts know it. “I’ll give you rice, canned stewed meat, alcohol,” promises the captain. The officers part with a portion of their rations to make food payments to the repairmen. The will do anything to not remain docked by the wall, anything to go out into the seas. There is a good reason the Bora is called the “ship of the like-minded” by the Sevastopolians. Heavy wind inflates the tarpaulins of the neighboring ships. Stormy February mist is covering the dam, the white "horseshoe" of the Konstantinovskaya Battery, and the way out of the bay. The Bora can go out under practically any weather conditions of the Black Sea. 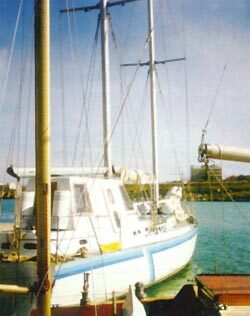 Its hull, a catamaran, is operated on a totally new principle of dynamic suspension on the surface of the water – powerful air pumps lift the ship, drastically reducing its draft, but at the same time it does not hover over the sea like a classical hovercraft but skims over it displacing water with its hull. Roaring of the warming up turbines penetrates the hull. Deck vibrates, bulkheads shake. Eyes of the three cats-rat catchers widen with terror, their tails beating nervously. I keep my distance from the sea loving cats. The ship’s dog Graf, however, lies peacefully on the afterdeck by the flagstaff in wait for the landing ramp to appear in the blue clouds of diesel smoke. There is still some time left to go down into the rattling belly of hell of the fleet’s missile carrier. “Are you sure you want to do this?” asks my guide, wincing. We take the vertical ladder down through the steel hole of the power generation compartment. Air, compressed by monstrous rattling, painfully impacts my ear drums. Noise insulating ear muffs are not sufficient to block out the noise, and the sailors use an old and proven method – they insert flashlight mini-lamps into their ears. Those who keep watch in the machinery compartment are the ones to pay for the speed with their health. It’s a bit scary to stay here when the ship is moving, amidst all that power, pressure, and voltage raging through the cylinders and pipelines. All this technology is not yet fully broken in - there's a good reason why in the sailors' inner circle, the Bora is sometimes called “the ship of three hundred surprises.” Each sortie carries the risk of a military campaign. For these guys, the turbine, engine, and electric systems experts, it makes no difference whether it’s wartime or peacetime. For them, death caused by a spurt of hot oil or by electric shock is more likely than death from a missile hit. I would award them with all the benefits normally given to the Afghan veterans. We ascend the pilot room. The captain, waiting for the last word from the operational duty officer, paces the room like lynx in its cage. The helmsman also languishes in front of his wheel, reminiscent of those they use in airplanes. We are waiting by the sea for the weather – the storm is growing stronger in the open seas. What if they cancel the sortie, why risk the Fleet Commander’s favorite ship? And then we have the “ok” for the sortie through the boom gates! The propulsion engines start up, howling, and the Bora lifts perceptibly. Through the glass half-arc of the head porthole one can see the hilly panorama of Sevastopol, crowned with a Monomakh’s Cap of the St. Vladimir’s Cathedral, pass by slowly. The number of times I left the Sevastopol bay and the types of vessels I've taken – water carriers and destroyers, yachts and helicopter carrier cruisers. Yet, this sortie is special – the soul is filled with a quiet, timid rejoicing – yes, the Black Fleet is alive, and its pulse is perceptible – here it is, beating under the deck of the Bora, in its bilge. Even at slow speed, the shoreline on both sides of the ship moves past unusually fast. But finally the boom gate nets are behind us and a frothy tail of water disturbed by the Bora runs astern of the ship. This is not just sailing, this is a frenzied flight. The ship is not pitching or rolling, it’s being thrown up and down in vertical tossing motion, draining your strength and shocking your feet with fine quivering reminiscent of electric shocks in an old, wet trolley bus. But we are not walking, we are flying! And in this impetuous semi-flight is the military luck and joy of the Bora. At this speed, the homing missiles won’t have time to lock onto the ship, torpedoes – to catch up with it, and even an explosion of a disturbed mine will be left far astern. On the other hand, the eight cruising missiles that the hovercraft carries is quite an impressive weapon. There are plenty of other weapons to fight off an enemy: a 76-millimeter rapid-firing anti-ballistic gun is sitting on the foredeck, and a couple of 30-millimeter anti-aircraft machine guns together with an AA defense missile “Osa-m” will enable the ship to engage in combat with an airborne enemy. Yes, in this sense the Bora is an officer’s ship. After all, officer's attack battalions are known to have existed in the dashing old years. Being a ship of the 2nd Rank, the Bora is entitled to a separate officer’s galley. But the entire crew eats from the same pot. And this pot is not too rich in nutrition – I personally searched in vain for chunks of meat in the soup garnished with buckwheat and potatoes. Appetizer consists of cabbage salad, and the second course is mashed potatoes with crumbs of meat and an almost sugarless, storm-time compote. Yes, and an expired bar of chocolate from the German humanitarian aid is handed out before going on a campaign. But the ship flies! The wave crests hurry past, not having enough time to fall, like immobile cobras frozen still by the Jericho flutes of the roaring turbines. “Three more hours at this speed and we cross the Black Sea from shore to shore,” notes the captain, poorly masking his pride. Really, what Russian is there who does not love fast riding! Alas, Gogol himself should be in the pilot room right now! Where is it? On what map? There it is, just climb the Vladimir Hill and glance over the fluffy blue of the sea horizon and over the bays wearing necklaces of ships. The bays of Sevastopol are melting pots of time… The number of battles that they saw, the number of ships that sank in the silt of their gloomy depths is enough for another full-fledged geographic sea. A lone pillar, overshadowed by the bronze of eagle wings, stands in the middle of a small man-made island like a white candle. An eagle lifts off and heads North, for a rendezvous with the St. Petersburg’s Bronze Horseman from whose hand he once flew here. Sevastopol is the child of St. Petersburg. The father-city passed on its secrets, its fate, and the names of forts and bastions, sailors and shipbuilders in its genes. 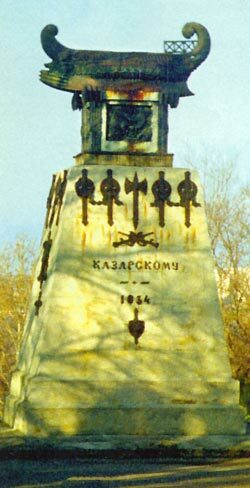 From the Monument to the Sunken Ships to the Pillar of Alexander lie the foundations of the Russian history. The now forgotten kinship between the two cities lies also in the fact that the Plate with the Oath to the City-State on the shores of the Beautiful Harbor (“I swear by the Earth and the Sun… I will oppose the scheming and the betraying or rejecting Chersonese… or the Beautiful Harbor…”), the plate with this vow is kept in a book depository on Nevsky prospect in St. Petersburg. The Southern Bay is the first and the oldest home base of the Black Sea Fleet. Today it is wearing a tight necklace of ships and vessels, propped against moorage walls. There are flags of all colors; flapping in the wind are the Soviet hammer and sickle flags, next to them – the blue cross on white background St. Andrew’s flags of the Russian Navy, the yellow and blue of Ukraine, the dark blue of the auxiliary fleet, the three-colored of the Russian Federation… “All flags will come to visit us.” And not just to visit – they are at home here. Seven feet of water under the keel of each ship, many thousands of miles behind them. But what lies ahead?